Many types of scale in our extensive range have an RS-232 interface for data transmission. With the help of the connection to the optional software or the data cable you can transfer the weight results data of the scale with software directly to the computer or printer. It is very easy to connect the scale with software and RS-232 interface to a computer. It will help you to save time and avoid mistakes which may happen during a manual data transfer. Extremely affordable, Scales with Software for everyday use. 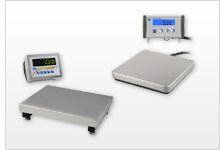 The Scales with Software has a platform size 600 x 900 x 80 mm. The capacity of the Scales with Software is 75 kg or 150 kg. Initialise the balance, weigh - it could not be easier. The basis weight Scale directly shows the result in g/m² with high resolution (0.1 g/m²) / the weighing unit can be changed to grams by pushing one button only. Verifiable waterproof Scale with Software in stainless steel with separate indicator (no corrosion). The multifunctional scale is manufactured to IP67, dust-tight and thus can also be temporarily submerged completely under water (up to 1 m depth). Scale with high resolution (0.0001 g), RS-232-interface and optional software-kit / with weighing ranges of 0 ... 100 g.
The scale with software PCE-SD CR series finds its application both in many production areas as well as in shipping areas. The scale with software features a standard RS-232 interface. In addition the scale with software PCE-SD CR series can be equipped with further interfaces. Scale with high resolution (0.0001 g), RS-232-interface. The scale PCE-IS01 is a professional system for counting, and consists of a quantity and a reference scale. The reference scale takes on the smallest components while the balance calculates the number of pieces. This scale is particularly well suited for inventories. The scale PCE-IS02 is a professional system for counting, and consists of a quantity and a reference scale. The reference scale takes on the smallest components while the balance calculates the number of pieces. This scale is particularly well suited for inventories. The scale PCE-IS03 is a professional system for counting, and consists of a quantity and a reference scale. The reference scale takes on the smallest components while the balance calculates the number of pieces. This scale is particularly well suited for inventories.